scrcpy is an application that allows displaying and controlling Android devices connected via USB or or wireless, from a macOS, Windows or Linux desktop. The application focuses on performance and quality, offering 30~60 FPS with a resolution of 1920x1080 or more, and low latency. While there are no official scrcpy Linux packages, an unofficial snap package was created (thanks to Ferenc Czumbil) a while back, which allows installing the application easily on Linux distributions that support snapd. I couldn't get the snap package to work when trying it a while back, but it's working now so I thought I'd write a new article for how to install and use the scrcpy snap package. It takes a bit more to get scrcpy running from snap than other snap packages, but it's still a lot easier than building scrcpy from source. 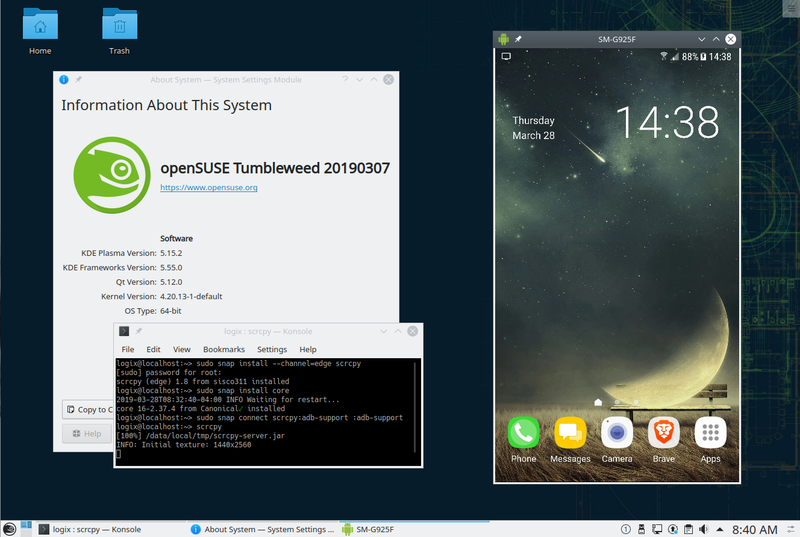 I installed the scrcpy snap package and tried to run it on Ubuntu 18.10, Linux Mint 19.1 (based on Ubuntu 18.04), Fedora 29, and openSUSE Tumbleweed. scrcpy worked on Ubuntu, Linux Mint and openSUSE, but not on Fedora (bug reported). The alternative is to install scrcpy on Linux from source, either by following the official instructions, or see the Linux Uprising article on installing scrcpy from source on Ubuntu, Debian, Linux Mint and Fedora. on some devices you may also need to enable an additional "USB debugging (Security settings)" option to be able to control the Android device from your desktop computer. Android root access is not required. scrcpy comes with ADB and scrcpy-server.jar bundled, so there's no need to install anything else other than the scrcpy snap. To install snap packages, you'll need snapd. This is pre-installed in Ubuntu 16.04.04 and newer, Solus 3, and Zorin OS. For other Linux distributions, including Arch Linux, CentOS, Debian, Deepin, Elementary OS, Fedora, Linux Mint, openSUSE, snapd installation instructions can be found in the Snapcraft docs. Restart your computer or logout/login after installing snapd. 2. Install the scrcpy snap package. Make sure your Android device is not locked when running scrcpy, and that you authorize scrcpy when prompted by a dialog on your Android phone. If you didn't authorize it in time the first time you ran it don't worry, just run scrcpy again.